Any person who is a legal resident of the State of Colorado, who is 21 years of age (18 years of age for a Temporary Emergency Permit). Also, a person who is a member of the Armed Forces and is stationed pursuant to permanent duty station orders at a military installation in the State of Colorado, and a member of the person’s immediate family is living in Colorado, is deemed a legal resident of the State of Colorado. Am I eligible for a permit if I have a medical marijuana card or own a dispensary? No. C.R.S. 18-12-203(c) states: A sheriff shall issue a permit to carry to an applicant who is not ineligible to possess a firearm pursuant to Federal Law. Federal Law 18 USC 922(g) (3) prohibits any person who is an unlawful user of, or addicted to, any controlled substance from shipping, transporting, receiving, or possessing firearms or ammunition. Marijuana is listed in the Controlled Substances Act as a Schedule I controlled substance, and there are no exceptions in Federal Law for marijuana purportedly used for medicinal purposes, even if such use is sanctioned by State Law. Further, Federal Law 18 USC 922(d) (3) makes it unlawful for any person to sell or otherwise dispose of any firearm or ammunition to any person knowing or having reasonable cause to believe that such person is an unlawful user of, or addicted to, a controlled substance. Any person who uses or is addicted to marijuana, regardless of whether his/her state has passed legislation authorizing marijuana use for medicinal purposes, is an unlawful user of or addicted to a controlled substance, and is prohibited by Federal Law from possessing firearms or ammunition. What type of handgun training is required? Can I take an Internet based firearms training class? WE DO NOT ACCEPT INTERNET TRAINING CLASSES AS PROOF OF FIREARMS TRAINING FOR A CCW. Where do I find firearms training schools? Look in your phone book or contact your local gun shop for places that offer firearms training classes. 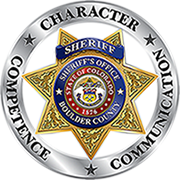 A personal check, cashier’s check or money order made payable to the Boulder County Sheriff’s Office for $152.50. When do I have my signature on the application witnessed? You must sign the application in front of a Sheriff’s Office Representative; therefore, you should bring your UNSIGNED application to the Records counter of the Sheriff’s Office, and it will be witnessed by a Sheriff’s Office Representative after you sign it and provide your driver’s license as proof of identification. Do I have to get fingerprinted? Yes. You will be fingerprinted when you turn in your application at the Boulder County Sheriff’s Office (we do not accept fingerprints from other locations/agencies). Do I need to have my picture taken? A permit holder must notify the ISSUING Sheriff’s Office within thirty (30) days of moving. A Change of Address form is available on our website. Or fax to: 303-441-4739; or scan and email to: (jbiekert@bouldercounty.org); Or walk it in to our headquarters at 5600 Flatiron Parkway in Boulder. IT DOES REQUIRE A NOTARIZATION. Failure to notify the issuing agency of a change of address is considered a Class 1 Petty Offense. You will NOT receive a new card (similar to how changes of address are processed with a Driver’s License). What happens if my permit is lost/stolen/damaged? A permit holder must notify the issuing Sheriff’s Office within three (3) business days of the loss, theft, or destruction of a Concealed Handgun Permit (Use the same form as you do for a change of address, and you may submit the form the same way you submit a change of address (see above suggestions for submitting a change of address form)). Failure to do so is considered a Class 1 Petty Offense. I am a resident of the State of Colorado, yet I have a permit from another state (Utah, Florida, etc.). Is my permit good in the State of Colorado? No. Per legislation signed into law in May 2007, if you are a resident of the State of Colorado (i.e., have a Colorado Driver’s License or ID card) and possess a permit from another state, that permit is no longer valid in the State of Colorado (check the issuing state to see if it is still valid in other states). If you are a Colorado resident and want to carry a concealed handgun in the State of Colorado, you must apply for a Concealed Handgun Permit from the State of Colorado per the instructions outlined on this website. Where can I get more questions answered before or after I have my permit? The website www.bouldercounty.org/sheriff and/or the packet of information first provided to you with your application are excellent tools for answering questions you may have concerning your Concealed Handgun Permit. You may also visit the Colorado Bureau of Investigation website for pertinent CCW information http://cbi.state.co.us/ic/. Finally, if you don’t find the answers you need, please feel free to contact the Boulder County Sheriff’s Office by email at jbiekert@bouldercounty.org or by phone at 303-441-3994.